With a testing regime in place all duty of care practices can be demonstrated to have been met. Tytec announces a world first; the introduction of cutting edge OTR tyre hydrostatic testing to further improve tyre safety for site personnel. 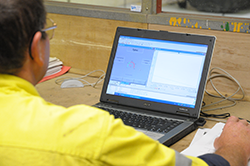 Our hydrostatic testing department is used to determine the serviceability of any tyre purchased, retreaded or repaired, improving the safety of your workforce and tyre efficiencies. Hydrostatic testing will reveal any defects normally hidden from view, details that a visual inspection by even a highly experienced technician could not see. Tyres for which there is no prior history available can be evaluated prior to entering service. When purchasing second hand tyres many tyre personnel are reluctant to mount these for fear of a tyre burst. A 40.00R57 tyre in an uncontrolled release of stored energy (inflation pressure) can be directly compared to a high explosive detonation, why expose your site personnel to this potential when Tytec can predetermine the tyres serviceability status before it is delivered to site. 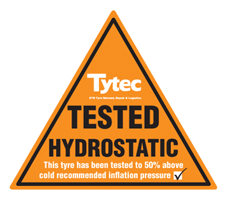 Tytec hydrostatically inflates the tyre to 50% above its nominal cold working pressure. We hold this for a period of time logging the test on our in house designed software which can be emailed to your safety or site personnel. This is aligned with AS1210 for air receivers. We don't need to explain this to you as we are sure you understand the similarities between tyres and air receivers. How often are air receivers on site tested? The most important point to this program is the SAFETY of the front line tyre service personnel. How do we know a tyre will not burst on inflation? Hydrostatically Tested we really don't.